There were few ‘home comforts’ for British soldiers in the mud-filled trenches of Northern France in the Great War. John Francis ‘Frank’ Roberts, of Rackenford, was enjoying one of them on the morning of September 9, 1916 – a mug of hot tea. He was taking a well-earned break after a series of ferocious encounters with the German army on the Somme. Without warning, a shrapnel shell burst over his trench, firing its lethal load into him. Frank, described by his commanding officer as ‘one of the very best, and a soldier through and through’, was killed instantly. He was 25. He died just a few weeks after his brother, Sam, was killed on the first day of the Battle of the Somme in July 1916. Frank, who served in the 2nd Devons, was one of the record 30 grandsons of Witheridge farm labourer John Roberts who fought in the Great War. In ten years of researching John and his grandsons who went to war, I was unable to trace a picture of him. 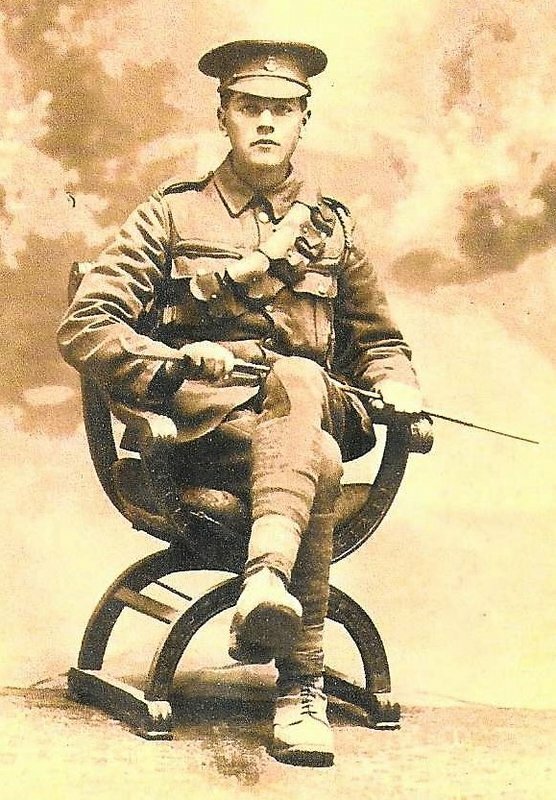 In October 2018 – at the first ever John Roberts Family Reunion – a photograph of Frank in WW1 uniform emerged. It was brought to the event by his nephew, Gerald Roberts, of Exmouth (whose father, Charles, was a younger brother of Frank). A wonderful picture of a young man about to go to war, it is shown here for the first time. Another brother of Frank, Ben, served in the Royal Engineers. He survived the war and ran a bakery and shop in Knowstone, Devon for many years. The story of John Roberts and his grandsons who went to war is told in the book, History Maker.